With the Mid Season Patch upon us, League of Legends is going through an absolute flurry of changes. 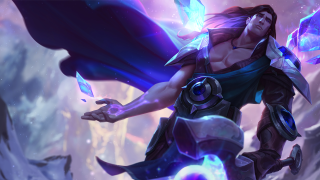 Whether it’s the new dragon (more like five of them) or the long awaited rework of Taric finally going live, League players are dealing with a whole lot of new content. While it’s tempting to claim that all new content is good, the truth is complex. This is especially true when new additions are still being tested, measured, and weighed—and in a regularly updated game like League, nearly everything is up to be rebalanced, re-evaluated, found wanting and then completely remade. Let’s take a look at the new content in League, because it affects more than just the professional circuit—it can have a major impact on everyday players. Let’s start with the latest Champion Update, Taric. Taric is one of the game’s earliest champions, and his age showed—he waddled around the Rift with a mass of spiky gem armour and triangle feet, his hair was an unmoving mass carved into a swirl, and he only had a minute of dialogue (by contrast, the most recent champion, Aurelion Sol, clocks in at twenty five minutes.) Riot had been open with their plans to bring Taric up to modern standards, and fans waited with bated breath. Sure, they were concerned about balance changes and competitive impact, but a very real portion of players were waiting to see what happened to his, well, fabulous nature. The important thing to recognize about a champion like Taric is that amidst serial killers, ancient gods of war, the undead, and patriotic generals, you had a guy covered with gems who had a soft voice. The fan base took these scant character traits and turned them into a meme, which influenced how people saw him—to many League players, Taric wasn’t just a gem paladin, he was a refreshing take on masculinity. Taric’s rework completely leans into these themes, to the point where his pectoral muscles are bare and his hair is constantly flowing, even when he stands still. Riot Games have always been seeking to one up their previous releases from a pure quality standpoint (I mean, consider Ashe before and after her 2014 relaunch), but they’ve recently been focusing on creating champions that fulfill a distinct identity. By rolling with the memes about Taric without turning him into a joke to be laughed at, Riot have shown that they’re trying to make an identity for everyone to appreciate in their game. Taric is just the latest example of this philosophy—Illaoi is a visual breath of fresh air as an enormous priestess, Rek’sai is an inhuman hunter, Ekko is a scrappy street kid relying on his wits. Each example subverts expectations and create a clear, distinct identity. This is a welcome standpoint from a visual and creative perspective, but let’s take a look at how it affects the game itself. When you take a look at the list of changes for the Mid-Season Update, it’s easy to get overwhelmed by the sheer amount of content. Mage items got reworked, and so did six mages! There are eight more mini reworks to the mage roster! Every mage can get a powerful item with a unique active that changes their play patterns! Oh, and Dragon got completely overhauled with a RNG element. Feeling dizzy yet? They ignite interest by overhauling old content and making things (hopefully) more balanced. They force players to dedicate time to learn all of these changes and figure out what happened to their old favourites or their new mains. The first goal is objectively a noble one; bad content shouldn’t stay in a game for legacy reasons, and chain-nerfing champions without addressing their core problems just feels terrible for everyone. The second goal is where things get muddy, and there’s a lot at stake here—sure, it’s frustrating for someone who’s a Silver II player to log on and frown at the new recommended items and perhaps feed for a game or two out of confusion. The real issue lies with competitive play, something that players rely on for their income and is essential to Riot’s growth and market dominance. Meta changes can seriously shake teams up, even though they currently dedicate hours every day to scrimming and practicing. Take a look at SKTelecom T1’s jungler Bengi, a two time World Champion—and a player currently on the bench, as current jungler Blank suits the meta more. Even small shifts can change up series. The Immortals were knocked out of the NA LCS Semifinals, and many lay the blame at Huni’s pick of Lucian top in a tank-dominated meta. If even a single patch can change the fortunes of a team, what will the Mid-Season Update do? It’s tempting to paint a dystopian picture of a future where Zyra mid and Malzahar jungle rampage over us all, but chances are that this will go like every other major update. Some teams will sink, other teams will thrive in the chaos. The question is: how many more radical updates and changes are left in League? Are the developers striving towards an elusive balanced state, or is the game on a constant tilt-a-whirl to keep things from getting too stale? In the constant stream of changes to give champions their own unique draw, will League lose its own identity? Don’t get me wrong—as a Vel’koz main, I’m delighted to shred opponents with a laser beam. However, Riot themselves have said they’re taking the long view on growing League. They’ll eventually need to question whether they’ve perfected certain systems, or whether they need to keep the constant stream of changes incoming. On the other hand, it’s hard to take too sour a view on League’s changes and evolution. After all, the new Shield of Valoran came from this process, and he is a sight for sore eyes. Only time will tell how the future will pan out for Riot’s approach to evolution and design. Perhaps the most radical thing Riot can do is announce that some of their features are finally set in stone.